Welcome to Outstanding Maths Tuition (OMT). At OMT, we provide high class Maths tuition to students of GCSE, A-Levels and University 1st year Mathematics. Our excellent success ratio is a result of our uncompromising emphasis on initial assessment, comprehensive plan of intervention and continual assessment through tests. We believe is working hard with our students and expect the same from our students. Our top-level exam preparation is through past exam paper attempts encourages students to solve problems by writing what can maximise their score. If you have concerns about subjects other than Mathematics, we shall be pleased to provide assistance through our highly professional teachers/tutors team. 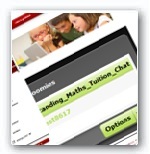 Outstanding maths tuition offers live chat facility for its members or other ones who ever interested in its servicce. Our mission is to enable children and young people develop an independent learning approach and make their weaknesses as opportunities to further their progress. We assist them adopt strategies that would encourage them to reflect on their learning and would make them resilient in their academic and professional lives. A mentoring-based approach in 1-2-1 tutoring of Mathematics at secondary, post-secondary and university (first year) level; from initial assessment to programme for learning sessions applying assessment for learning (AfL) methodologies with regular homework assigned and checked; consolidation of concepts is carried out by past exam paper attempts and filling in any learning gaps. Tutoring methodology has been tried and trusted for over 30 years. I struggled with A level maths and my tutors at college advised me to stop taking the subject as they did not believe I would be able to pass the course. Mahmood gave me confidence in my ability at maths and motivated me to do well. I now have an A in A level maths. I am very greatful for his help and would recommend him as a tutor. My daughter has been with Outstanding Maths Tuition since the age of seven years. She is now due to take her GCSE in 2012. Her tutor has been very methodical and result-oriented in his work and she has developed her Maths concepts tremendously. She worked hard with her tutor during the primary years and got maximum output during her SATs tests. Her tutor mentored her so well in her secondary years that she now understands how to gain independence in learning any subject. I contacted Mahmood as I was concerned about my progress in maths. His friendly and constructive sessions encouraged and helped me. I would not have achieved an A Grade GCSE without him. Without these sessions I don't think I would have half as much confidence going into my A-Levels. Mahmood always tells me that his success is my success. I have succeeded, and so has he and I would have no hesitation in recommending him. A real positive learning experience, both supporting and enhancing my son's regular college studies. The tutorials provided a solid knowledge platform, enabling my son to tackle even the most onerous of maths problems with a far greater degree of confidence. Most importantly, the results of the weekly coaching sessions were manifested in successful university entry exam grades at the end of the year. I felt my son was underachieving in GCSE Maths at school and Mahmood was recommended to me. After an initial assessment, Mahmood devised a learning package for my son which also included structured exam preparation. There were regular checks on his progress and I felt Mahmood had a very good understanding of my son's strengths and weaknesses. The one-to-one tuition enabled my son to talk through problems that he felt unable to discuss in class. My son now has an A* at GCSE and, with Mahmood's help, I am expecting similar success at A Level! Now you can put your complains in our complaint box for get us better position in near future. Outstanding Maths Tuition (OMT) provide top-class assistance in Maths learning at affordable prices. Our emphasis is on learning for personality and career development with mathematics attainment to make positive change in pupils's lives. We believe in delivering quality of service and a professional advice with a comprehensive intervention plan with pupils' agreement for implementation.